Nicholls reins supreme with Dodson & Horrrell! 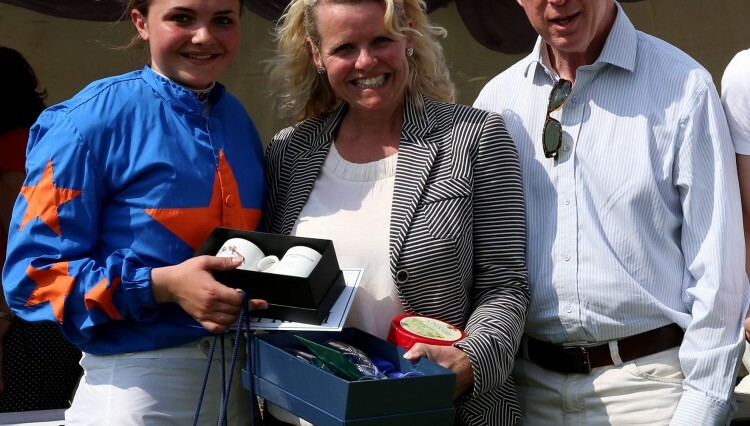 This time it is Megan Nicholls who wins the 2014 Dodson & Horrrell Point-to-point Owners and Riders Association (PPORA) Novice Riders Series at the Final at Knutsford Races Club, Tabley, Cheshire on 18th May. This year’s Dodson & Horrell PPORA Novices Riders Series was won by Megan Nicholls, daughter of leading National Hunt Trainer Paul Nicholls, riding the nine year old bay gelding Join Together who is trained in Somerset by Mrs Rose Loxton and owned by Mrs Wendy Fogg. Megan, who is just 16 years of age, managed to fight off fierce competition from Charlie Hammond (finishing in second), riding Ferbane Man who is owned by his father and trained by his mother in Worcestershire. Charlie rides work for Dr Richard Newland who trained the winner of the 2014 Grand National so a very competitive race all round! Megan is currently leading National Novice Lady Rider and started the day by winning the Mixed Open at Tabley on a horse part owned by her father. Paul Nicholls, who was away racing in France, was a very proud father and commented “Megan really deserves the title. She is very committed to her race riding and certainly has the talent to move up the ranks in the future”. 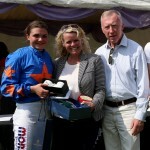 Megan was presented with her prizes by Dodson & Horrell’s Technical Director, Chris Gordon. Chris commented “It was a very competitive race with a very worthy winner. This Series certainly highlights potential stars for the future and we look forward to watching with interest the career of Megan Nicholls and other riders that took part in the Final”. Both these young riders came up through the ranks of Pony Racing which is a brilliant spring board for careers in National Hunt Racing. Dodson & Horrell first became involved in point-to-point racing at a local level in 1987 supporting the Oakley, the Pytchley and Woodland Pytchley Fixtures. The sponsorship has now extended to a nationwide series of races – made up of twenty-two races at Point-to-Point courses across the country. Over the years Dodson & Horrell has sponsored around 640 Point-to-Point races and is extremely proud to be involved with this Series. Looking for an exciting work opportunity abroad? The West Riding Rodeos Win West Riding Endurance Challenge!